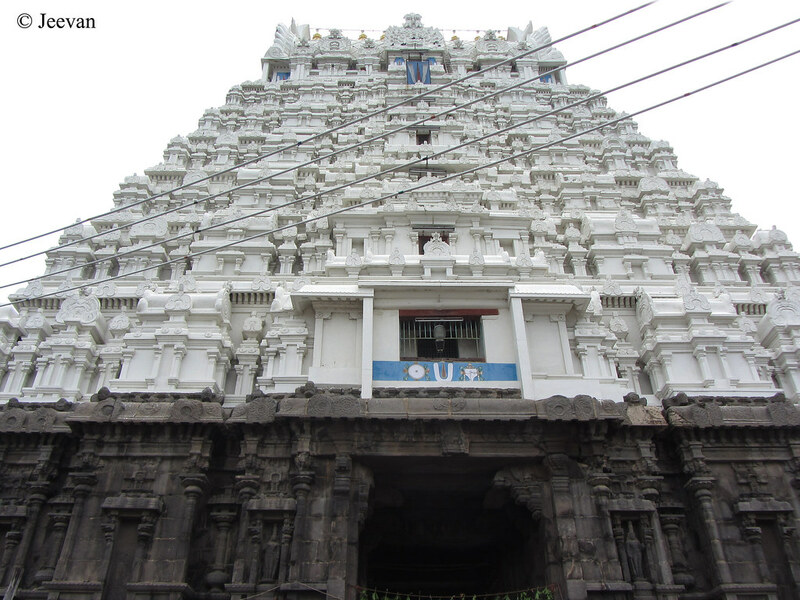 While back from Kanchipuram, attending a cousin’s marriage last week, we stopped at the Varadharaja Perumal Temple in the suburb of the holy city or temple town Kanchipuram. Being interested in architecture, history and admiration for sculptures I couldn’t stop taking photos on temple towers, whatever the condition it may look, esp. 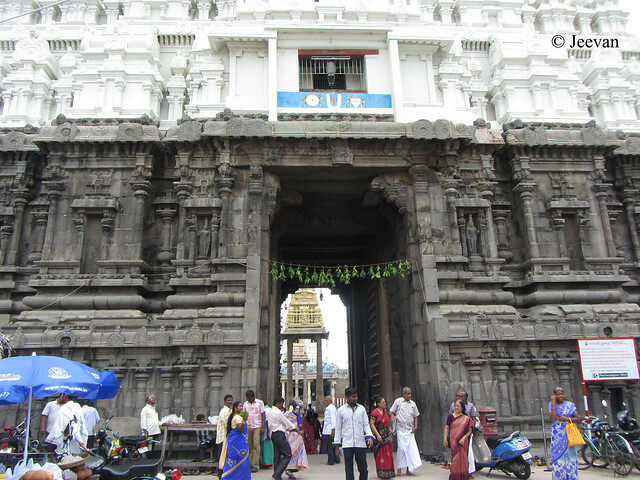 the outstanding Rajagopurams (the main gateway tower of big temples) alike. The Vardharaja Perumal Temple tower is one of a marvelous building I started to shoot once entered the west Mada St., though I didn’t went inside the temple I enjoy taking photos on the Rajagopuram, a 130 feet tower in 7 tiers. Though there’s a belief that the temple was first built by the Pallava king Nandivarman II, was originally built by the Cholas in 1053 and expanded during their successive reigns. The temple being one of the 108 Divya Desams (premium place/temple) of Vishnu and believed to have been visited by the 12 poet saints (Azhvars), has the tallest walls I ever seen at any temple which could be measures more than 30 feet height. The temple tower is painted in white and bottom is left raw with couple of sculptures and simple detail of pillars and designs on walls. 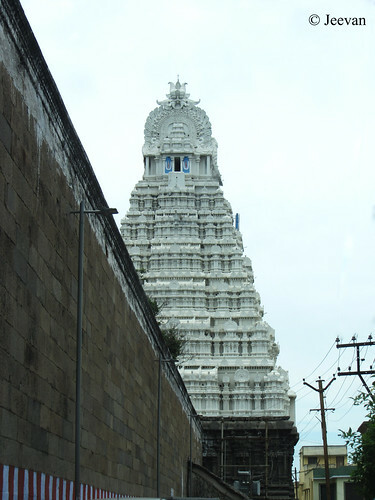 Usually the Rajagopuram in big temples are supposed to be the tallest one, but in Varadharaja Perumal Temple, the eastern gopuram (tower) is taller that the western one, one you see here. I have been inside the Varadharaja Perumal temple as a kid and remember touching the gold and silver lizards etched on the celling, which is a part of the temple complex. Apart that I couldn’t recollect anything, but the temple is famous for its architectural pieces, the huge stone chain sculpted in a single stone. There’s also a 100 pillared hall and sculptures depicting Ramayana and Mahabharata, is a masterpiece of Vijayanagara architecture. Wow! The details and character of the temple's roof are very interesting and nice. Today I learn from you that it is a masterpiece of Vijayanagara architecture! All the Indian temples in my country had the experts and skilled craftmen flown in from India to build and assemble the elaborate roofs. I love to admire them like a story book! Here is a pious place with such exquisite and intricate designs. Temple culture in South India is unparalleled! I visited this Temple a few years ago - the huge lizard is still there. I also like the white color of the Gopuram. Should visit Kanchipuram once again soon.. I am always amazed with the architecture of temples in South India. Such intricate and delicate works of art! Hi Jeevan, What a marvelous temple... I'm SO impressed with the details in that architecture... WOW is the one word which comes to mind... You certainly captured some great pictures. This looks like a marvelous temple to visit. The details in the towers and wall are amazing. Thank you for sharing this with us. Beautiful pictures of the temple gopuram, Jeevan! I too had visited this temple many years back. Don't remember much. Must visit again soon! South Indian temples and their architecture always leaves me awestruck! these temple buildings are way too awesome!